I confused "motion sensor" with "emotion sensor" and got excited that the security system would be able to sense my emotions. Upon hearing that a person's home is broken into every 13 seconds, I wondered why that poor person didn't buy a security system and wondered how he'd have anything left taking after being robbed so often. Once I blew my cover, I lit into the guy on the other end of the phone for earning his money by cheating folks out of theirs. In this guy's attempt to prove he was legit, he gave me another number to call, (310) 362-3060 which ended up to be an invalid number as well. I had been hearing about Goat Simulator from by daughter for the better part of the week. She had seen a "Let's Play" on it from one of her favorite Youtubers and wanted to get it. So, once her report card came back clear, I broke down and bought Goat Simulator for her. Of course, I had to try it out myself in order to make sure it was appropriate. The developers over at Coffee Stain Studios made Goat Simulator as a fun project for Game Jam and didn't intend to release it to the public. Once public outcry motivated them to release it, the put a little polish on it, slapped a $10 price tag on it and released it out into the world. And, for a $10 game, it's a lot of fun. You're a goat. And you run around head-butting things which leads to horrific screams and Michael Bey-esque explosions. It's basically a "pewdiepie" game. What I mean by that is that it's a game made for the express purpose of filming yourself doing things like blowing up a propane tank and then laughing or screaming your head off, then you run over to the next thing you can interact with and repeat the process so that you get enough footage for a small Youtube clip. That being said, I haven't had this much fun just mucking about in an open-world game in a long time. Goat Simulator is a fun game to just turn your brain off and explore in. There's a lot of hidden unlockables around the game world and there are a number of zany achievements to try to get. And I haven't even explored any mods yet. 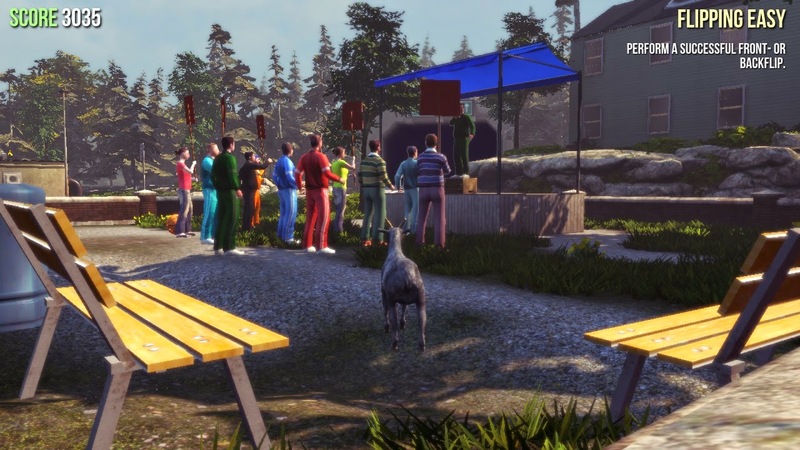 Basically, Goat Simulator is the stupid popular game of the month. It's funny, amusing and worth a bit of cash, but soon enough, we'll all move on, but we've had fun with it, and that's all that matters. I'd say kiddo and I both got $10 worth of entertainment out of it. There's a supplement out there called Brain Storm Elite that supposedly helps you with focus, memory and other cognitive functions. They called looking for Clovis early the other morning and Clovis expressed concern about explosive-diarrhea as a side effect. The call got cut off. About an hour later, another rep from Brain Storm called and, by then, Clovis figured that he wanted a supplement that would make him forget things rather than help him remember. That particular rep doled out some life-coaching advice for him and then hung up when Clovis claimed to have "A PhD in Awesome!" As nice as these two reps were, I have no qualms about messing with them, given the rampant reports of Brain Storm engaging in billing fraud. In a move that should upset about four people, Google has acquired and destroyed SoftCard, the NFC-based (tap-n-pay) mobile payment system developed by Verizon, AT&T, and T-Mobile. Originally known as ISIS Wallet when it was launched in 2010, SoftCard had to change its name in 2014 in order to avoid confusion between it and the terrorist group Islamic State of Iraq and Syria, which was also known under the abbreviation "ISIS". In order to drive users to Softcard, carriers intentionally blocked competing NFC payment systems such as Google Wallet, so, the brain trust behind Softcard are reaping what they've sown here. My own experience was that, while Softcard had a better UI than Google Wallet, Softcard's ability to actually work was very hit and miss, so I hardly ever used it.